Generally pretty hardy critters, most goats don't require elaborate shelter provisions. Good, basic housing meets their needs. Most goats only need protection from snow and driving rain -- they're fine as long as it's dry. A large shed fills the bill, as long as it opens to the south for extra warmth in cold weather. Whether you allow your does to raise their own young or separate the kids soon after birth for hand-raising, they require secure housing accommodations. For sheds, minimum back eave heights of 4 to 6 feet are adequate, with the front eaves higher at 6 to 8 feet. Flooring choices include clay and concrete. 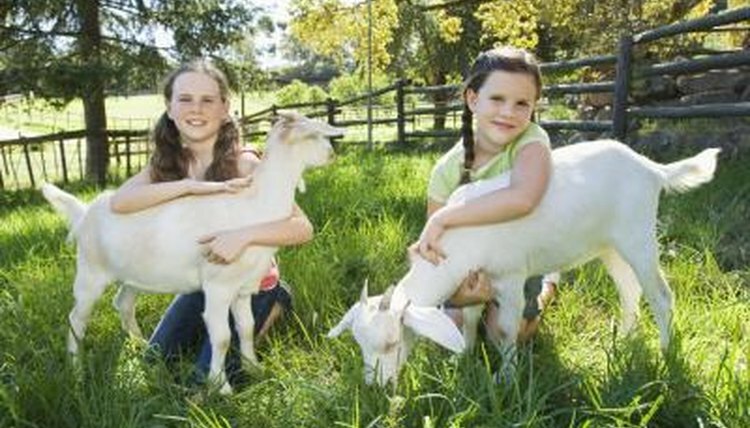 While it's important to predator-proof any goat housing and pasture, kids are especially vulnerable. Keep them penned in at night. The fencing around the pen must keep kids in and predators out, so woven wire is a good choice. You might want to add a guard donkey or llama to the herd for kid protection. Because dwarf or pygmy goats are so small, their shelters don't have to be large. Provide between 8 and 10 square feet of space for each caprine. For safety, they're also better kept in at night. Inside their pen, provide objects for them to climb and play on. Old picnic tables or similar items are good choices. If you're raising dairy goats, you have a few other considerations for your housing facilities. The milking stations must be scrupulously clean and sanitary. Design your milking area so it's easily accessible for you and the goats, as well as relatively simple to clean and disinfect. Otherwise, housing for dairy goats is much the same as for other types of goats. Good ventilation and a dry environment goes a long way in keeping your milk goats healthy. If you live in a very cold climate, goats might need enclosed housing. If you have a barn on your property, stalls can suit their needs as long as they can't climb out of them. Sheds with doors are also suitable. While promptly removing soiled bedding is a basic part of goat husbandry, it's especially important if the goats live in enclosed housing since the ammonia from urine builds up quickly. Goats breathing in these fumes often develop respiratory diseases. Avoid wooden flooring in barns or enclosed sheds, as the wood traps urine and odors.